AlDub made history on September 19 with 12 million tweets for the hashtag #ALDUBMostAwaitedDate only to see it doubled a week after on September 26 with 25.6 million tweets for #ALDubEBforLOVE. On their biggest show yet, which shall be beamed live from the Philippine Arena, fans express on Twitter their goal of 36 million tweets to celebrate Eat Bulaga's 36 years on TV. None from the KalyeSerye cast and from Eat Bulaga confirmed the Twitter goal but the AlDub fans are already starting the campaign on Twitter. 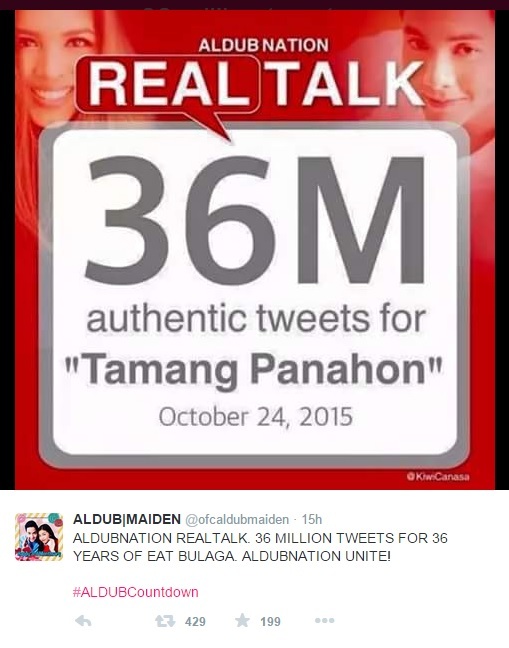 Today's hashtag as tweeted by @EatBulaga a little over midnight, October 24, is #ALDubEBTamangPanahon. Let's see if we will tally 36 million tweets or more before the day ends. With the goal of raising funds to build libraries in public schools (READ: AlDub Goes To The Philippine Arena), Eat Bulaga also aims for a record-breaking TV rating for one of its biggest live shows yet. Basing on AGB Nielsen Mega Manila data, the highest TV rating for an Eat Bulaga show with a KalyeSerye episode is the 45.7% rating registered on September 26, the same day that the 25.6 million tweets were posted. For sure, it will be a historic episode for Eat Bulaga who raised an estimated PhP30 million worth of funds to build libraries in public schools nationwide. Here is a report by 24 Oras featuring the last-minute preparations for today's very huge episode. P.S. Here's a video of Alden Richards's performance at the launch of his sophomore album last week in SM North EDSA Cinema 11.